You often hear the question, “What is more important, technique or fitness?” For the coaches who’ve actually worked with swimmers on deck, the answer is always technique. I have worked with hundreds of swimmers and have never encountered a swimmer who wasn’t limited by a glaring technical error. If technique is poor, it will certainly affect an athlete’s ability to reduce their drag and increase their propulsion. You are always working on technique, but luckily every stroke you take offers a chance to improve up on it. However, being told over and over again that you have poor technique is often what creates a slow swimmer. When an athlete is told their technique is limited their first reaction is to spend all of their time working on drills and nothing else. This is a huge mistake—an athlete must always be working on their fitness to be able to hold their technique longer. You often hear of triathlon swim programs spending the first three months of the season working only on technique, and I urge you to stay clear of these groups. Think of this from a running perspective, would a runner spend the first three months of a program only doing drills and no actual running? Of course not! The off-season is when you should be as non-specific as possible. The beauty of DPS work is that you are forced to slow your stroke down and work on the technical errors that are limiting you from being faster. You can’t fix a dropped elbow at a faster cadence. Having an athlete focus only on increasing their arm cadence is a crutch that will be exposed over the longer distances when they become fatigued. The misconception with DPS work is that it’s done at an easy effort. You need to go fast to create usable drag to make DPS work effective. Getting faster in the pool requires laser focus on technique and the ability to be okay with being uncomfortable. To get faster you have to go faster than normal. If you know your technique is limited in an area, doing longer repeats early on isn’t making you better, it is just reinforcing bad technique. The goal is to extend your new technique changes from shorter repeats to longer repeats at specific paces. These are similar to your running hill repeats. You won’t hold more water with a flexed arm versus a relaxed arm. In fact, a tense arm is probably limiting your shoulder’s range of motion. If an athlete is having trouble getting their elbow into the correct position for their catch phase, there is a good chance their arm is too tense. This is extremely common because everyone believes the power comes from your catch, so cueing athletes to “pull hard” naturally tenses the athlete up. Also, if an athlete has issues with their elbow position in the catch phase they should limit their paddle usage. Paddles can also create excessive hand tension that limits shoulder mobility. To develop an athlete’s ability to keep a relaxed arm, keep the work at sub-threshold pace. The goal is to resist tensing up as the speed increases. The biggest mistake athletes make is not creating forward motion with their trunk. However, the catch phase and forward acceleration go hand-in-hand. If your hand and elbow aren’t anchored, your attempted body rotation will translate into wiggling down the lane. Swimming with a pull buoy between your shins is a tip I learned from an Olympic triathlon coach. I’ve found that it forces the athlete to engage and utilize their core at all times. My athletes don’t use paddles in the beginning of this process as we try to ensure they are catching water naturally. As the athlete progresses in competency and speed, we’ll add a second buoy to add more drag. Everything about going faster in the water revolves around improving your catch phase. Many of the micro-issues that happen in the water exist because you’re dropping your elbow. Think of dropping your elbow in swimming as having your knee buckle when you run—you cannot transfer power forward when this happens. The goal of the catch phase is to leverage water backwards while simultaneously accelerating your torso forward. The issue with dropping elbows is that it directs water downward and provides your body zero stability to accelerate forward. The most important space to be leveraging water backward is from your head to your hips, unfortunately this is also most commonly when an athlete drops their elbows. You have an “airplane recovery phase.” These are the people whom you constantly tangle arms with in a pool. 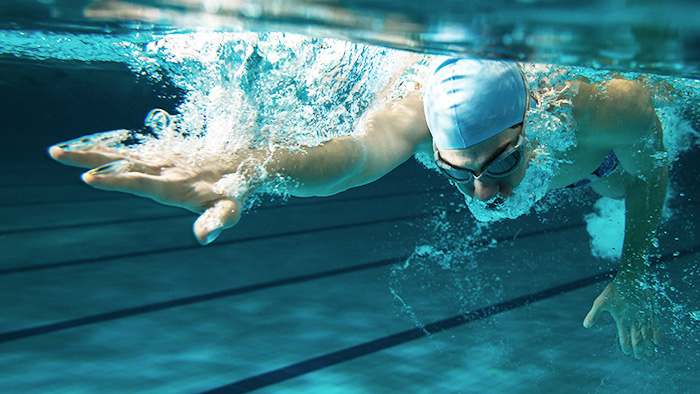 Focusing on more shoulder rotation will allow you to set up a better entry into the water. Entering the water too early. When an athlete’s hand enters the water near their head and then extends forward, the hand typically flips up creating a “STOP” effect. When your hand flips up, your elbow naturally goes down. Your hand doesn’t remained anchored down when traveling backward. When the hand “breaks” to the side, the elbow will collapse. Looking for more ways to gain some speed this off season? View my part one of my Off Season Speed series about high intensity hill repeats.